The honeymoon is over for Luke Ravenstahl, the 27-year-old who became the youngest mayor of a major U.S. city last Sept. 1. In a year, Ravenstahl has gone from taking questions on a national chat show to being grilled at an ethics hearing over his participation in a charity golf tournament. Excitement and solemnity accompanied Ravenstahl's first weeks as mayor of Pittsburgh. He took office just hours after his predecessor, Bob O'Connor, 61, died eight months into office following a six-week fight with a rare cancer. It seemed that everyone - even Mark DeSantis, a Republican now challenging Ravenstahl in the November election - was eager to give the newcomer a chance. Now, however, Ravenstahl's critics are more outspoken, his supporters more hesitant. Many say he hasn't produced enough change in this distressed city. "There was this sense that with someone new, that was young, we might bring change," DeSantis said. "The problem is nothing changed, nothing changed in 12 months." The city of 312,000 is US$1.2 billion (EUR880 million)in debt, has been defined as financially distressed by the state, has a shrinking population and will likely face shrinking tax revenues as expenditures rise over the next five years. Ravenstahl, who spent three years as a city councilman, points to successes as mayor that include a balanced budget, funding to attract new businesses and the addition of new apartments downtown. "I'm comfortable with where we are as a city and I think we've done some wonderful things over the past year," he said in an interview with The Associated Press. "I think that momentum is there for the city to be great." The criticism will likely have no impact on his campaign. Pittsburgh is a union town where Democrats outnumber Republicans 5-to-1. Ravenstahl's only challenger in the November election is DeSantis and his name will not be printed on the ballot sheet - anyone wanting to vote for DeSantis will have to write his name on themselves. Nevertheless, the complaints from political adversaries, former city government hands and editorial writers have become more fierce. Newspapers slammed the mayor for flying to New York in March for dinner and drinks aboard a private jet owned by Ron Burkle, the billionaire co-owner of the Pittsburgh Penguins. Hours before that trip, a deal had been cut to build a new hockey arena and keep the beloved team in the city. Ravenstahl later said he talked about campaign fundraising and denied the trip was a payback for the arena deal. Tempers flared further because Ravenstahl did not make it back in time to meet with residents of the low-income neighborhood where the arena and a casino are going up. 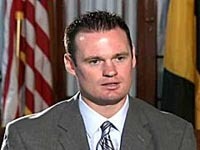 Ravenstahl was criticized weeks later when he failed to attend a meeting of women's groups who opposed the promotion of police officers previously accused of domestic abuse. Initially, he refused to say where he had been. It quickly surfaced that he had been at a charity golf event, where his US$9,000 entrance fee was paid for by the University of Pittsburgh Medical Center, the city's biggest employer. Questions over the fee landed Ravenstahl before the city ethics panel last month, which determined he did not violate ethics rules because the event was for charity. The panel did, however, ask him to consider tightening the ethics rules. "It's troubling that golf seems to be his principal public policy," said Joseph Sabino Mistick, a law professor at Duquesne University who spent three years as executive secretary to former mayor Sophie Masloff. "You would hope that he would be spending more time on the fiscal disaster, the fiscal problems, that are really at the heart of the future of the city," Mistick said. Masloff, Pittsburgh's mayor from 1988 to 1994, said she never attended expensive charity events while mayor, but thought the criticism of Ravenstahl was unfair and overblown. "I think he's a young man and he has potential," Masloff said. "He just has to prove it." Ravenstahl believes some of the criticism comes partly because of his youth. While his age won him plenty of good publicity - landing him on CNN, the front page of The New York Times and in Esquire magazine - it also made people trust him less, he said. He said a year in office has taught him to be thick-skinned and do whatever he thinks is necessary for the good of the city. "When you're 27 you have to prove yourself," Ravenstahl said. "And I'm still working to do that."